The spirit of the Church is the spirit of God: It knows how to unite the practical with the beautiful. So that, seeing such a work of art, we notice that it makes use of the practical almost as an afterthought, and beauty is admired as if it were the only thing that exists. The purpose of the practical is to serve the body of man without disturbing the soul; the end of beauty is to enchant the soul and elevate it to God. The stained glass window, in addition to being beautiful, is functional because it brings light into the building. The variety of these stained glass windows is incredible. We see holy kings in one. In another, Our Lady shines with the Infant Jesus. What lacework. What glass jewels. What splendor. Every window pane is a precious gem. Practical purpose: illumination. Spiritual purpose: to present beauty, truth within beauty — the highest truth, Divine Revelation which Our Lord Jesus Christ and the Holy Spirit brought to this earth. What a variety of shapes, colors and splendor of light. Everything is so rich that it is not worth separating. Because even though each fragment of stained glass is beautiful, the ensemble is so much more beautiful that the soul does not feel inclined to focus on detail. The Book of Genesis tells us that God, in creating the universe, rested considering His creation, and said that each thing He made was good and the ensemble was very good. Considering the stained glass windows of Chartres, it can be said, paraphrasing our Creator, that each part is good and beautiful, but the collection is most excellent. One is inclined to focus only upon the beauty of the whole. There is a magnificent analogy between the beauty of God's creation and the fruits of human art, which Dante described as the "grandchildren of God." Excerpt from a meeting given by Prof. Plinio Corrêa de Oliveira on February 10, 1994. Translated from Portuguese without the author's revision. The town of Chartres is located in the Loire Valley 88 km (50 miles) southwest of Paris. 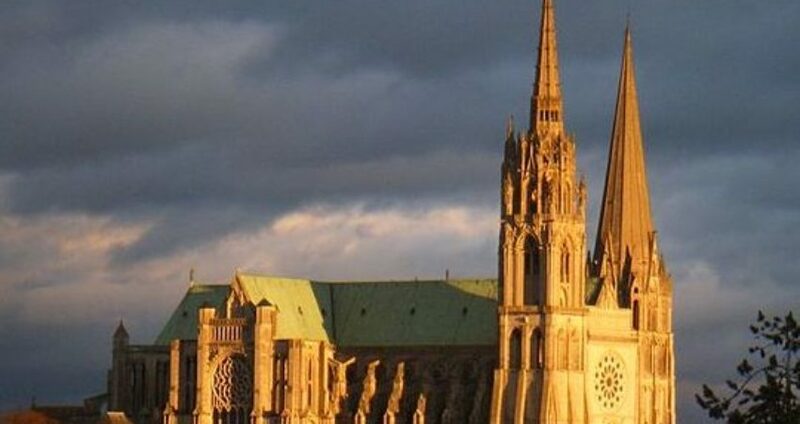 Its main building is the monumental Cathedral of Notre Dame de Chartres, whose construction began in the eleventh century. This masterpiece of Gothic art is one of the largest cathedrals in Europe. Dedicated to the Blessed Virgin, the temple is famous throughout the world, due to its wealth of sculptures and the beauty of its many stained glass windows. Their colors are stunning, and depict biblical passages from the lives of saints and scenes of everyday life in the Middle Ages. The Veil of the Blessed Virgin is venerated in this Cathedral. It was given to Emperor Charlemagne by Constantine Porphyrogenitus and Irene, transferred about 876 by Charles the Bald from Aachen to Chartres, and raised as a standard in 911 by Gantelme, the bishop, to put to flight the Norman Rollo. In 1360 Edward III of England, and in 1591 Henry IV of France, passed reverently beneath the reliquary containing this veil, as a sign of submission. The consecration of the cathedral occurred in 1260, and St. Louis IX is said to have attended the ceremony. The stained glass windows are the finest in the world — they contain 3889 figures. The upper windows were presented by St. Louis, and St. Ferdinand and Queen Blanche of Castile. The porches and windows represent in magnificent symbolism the glorification of Mary. The choir enclosure with its beautifully sculptured groups dates from the sixteenth, seventeenth and eighteenth centuries. The cathedral was damaged during the French Revolution when a mob began to destroy the stone statues on the north porch. On this occasion, the anti-Catholic rabble was stopped by faithful townsfolk who checked their sacrilegious riot.